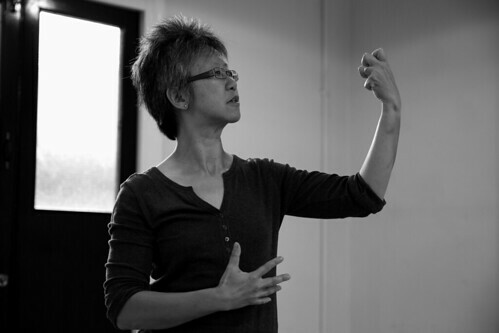 Yang-May developed the original script of Bound Feet Blues at the Creating Solo Performance workshop run by Luke Dixon and Sean Bruno at the Centre for Solo Performance in early 2014. This culminated in a try-out of the first half of the piece at Going Solo, a scratch nigh event at Conway Hall, which was received enthusiastically by the 50+ strong audience. As a result of this scratch night performance, Yang-May was invited to present the piece as part of the South East Asian (SEA) Arts Festival in Autumn 2014. With director Jessica Higgs, she developed the full length version of the show over the summer. Bound Feet Blues received its first performance through a showcase at Tristan Bates Theatre in October 2014. The work was supported by Arts Council England. The full production returned to the Tristan Bates Theatre for a three week run from 24 Nov – 12 Dec 2015, made possible with funding from Arts Council England and sponsorship by The Housing Finance Corporation. The show was invited again to be part of the SEA Arts Festival. The show interweaves the story of Yang-May’s great grandmother who had bound feet and Yang-May’s own coming out story through a series of intercut vignettes. The stories are both personal and universal, intimate and epic, covering in its sweep the social history of footbinding, and the experiences of many individual lives lived across China, Europe and Australia. Yang-May says, “I see using my body and voice as a single instrument to convey the story and create character, action and location. As a child, I loved listening to the stories my mother and grandmother told about their lives and our family heritage. By taking these stories into the theatre and dramatizing them, my hope is to evoke in the audience a reciprocal inner journey of the themes, experiences and dilemmas in the piece. 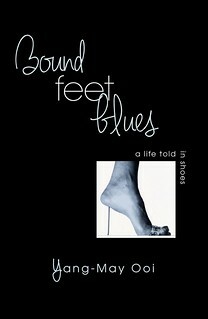 The BOOK, Bound Feet Blues, is framed by the Conway Hall performance as a way in to exploring in depth the stories behind the story featured in the stage show. 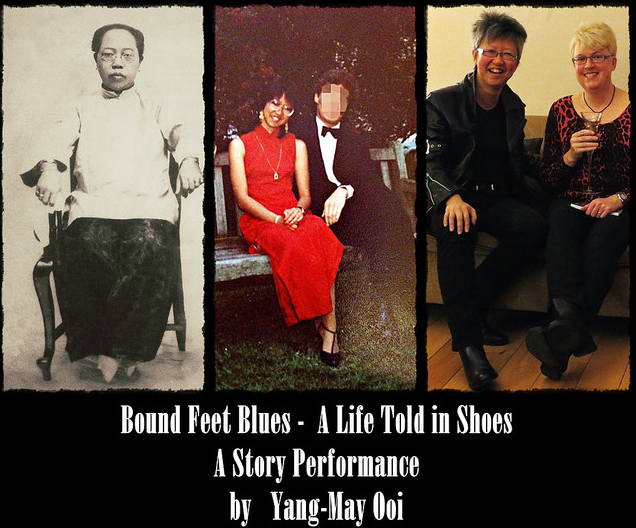 In this way, the book is also a record of Yang-May’s creative journey from introvert writer to acclaimed stage performer as well as a memoir that interweaves family, personal and cultural history told through footbinding and shoes.